Lua error in Module:Location_map at line 488: Unable to find the specified location map definition: "Module:Location map/data/USA West Virginia" does not exist. Charleston is the capital city of West Virginia, a state of the United States of America. It is where the Elk and Kanawha Rivers join in Kanawha County. As of the 2000 census, Charleston has 53,421 people living in it, which makes it the largest city in the state. 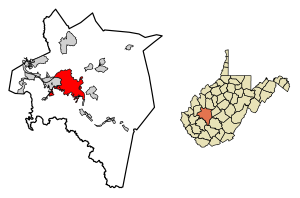 It is the county seat of Kanawha County. ↑ "US Gazetteer files 2010". United States Census Bureau. Archived from the original on February 20, 2011. Retrieved January 24, 2013. ↑ "American FactFinder". United States Census Bureau. Archived from the original on February 17, 2012. Retrieved January 24, 2013. ↑ "Population and Housing Unit Estimates". Archived from the original on May 29, 2017. Retrieved June 9, 2017.